Singer Island, Florida&apos;s Sailfish Marina restaurant was in aprs-fish mode when I arrived around 6 p.m. At its outdoor tables and bar, salty types—mixed among snowbirds and coeds—sported Guy Harvey T-shirts and deep tans as they unwound after a day of chasing a reported hot sailfish bite. From a dock hard by the restaurant&apos;s entrance, a father and son tossed bread to a school of jacks and gleefully watched as the fish fought over the scraps. 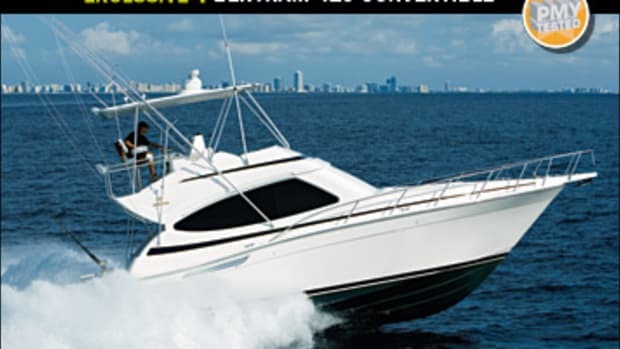 And overlooking the whole scene from the terra firma end of the finger pier, just a stone&apos;s throw from all the action, was the Albemarle 330 XF. 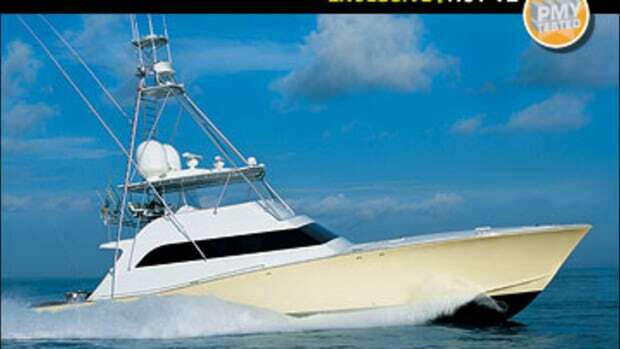 I&apos;ve long admired the profile of the Edenton, North Carolina builder&apos;s Express Fisherman (XF) line—to me the boats have a tough, barebones appeal, and the 33 has those qualities in spades. 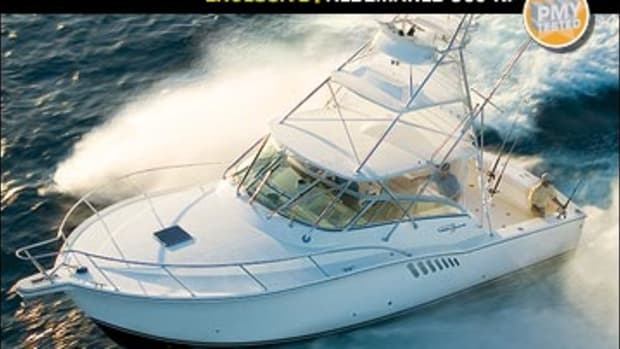 Her sparkling-white gelcoat was set off by Albemarle&apos;s distinctive hull-side vents, designed to feed plenty of fresh air to her standard twin 425-hp Cummins QSB5.9s. Pompanette&apos;s Pro Series ladderback helm and companion chairs graced the bridge deck, and she was topped off with an optional PipeWelders package that includes a tuna tower, double-spreader outriggers, and a center rigger. 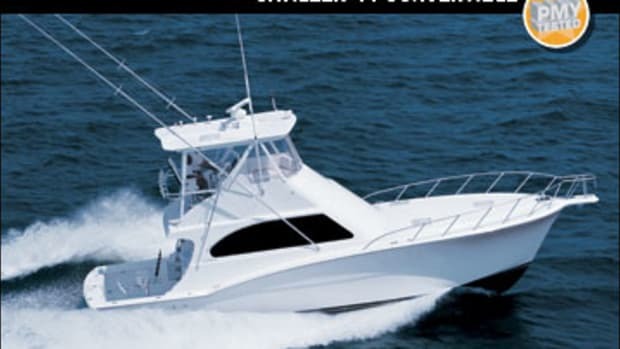 I left the marina excited about the possibility of hooking up on a sailfish, as we planned to fish her the next day. At 8:15 the next morning, I was standing in the cockpit of the 330 as the captain piloted her through Lake Worth Inlet and into the Atlantic. 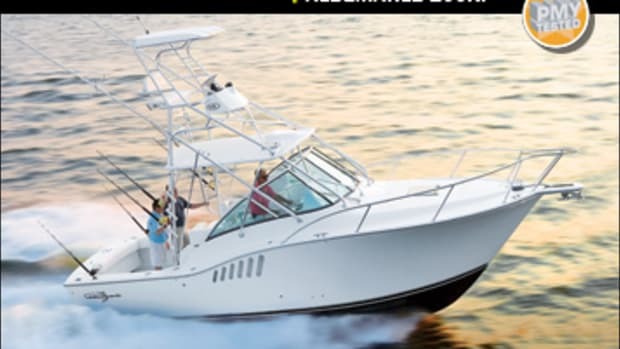 As Albermarle&apos;s dealer development manager Ted Haigler and Jamie Brandon of Tuppen Marine (Albemarle&apos;s Palm Beach dealer) worked the bait-prep station—which included a sink, cutting board, and on our boat an optional stainless steel bait cooler/freezer—I got acquainted with the cockpit&apos;s other features. 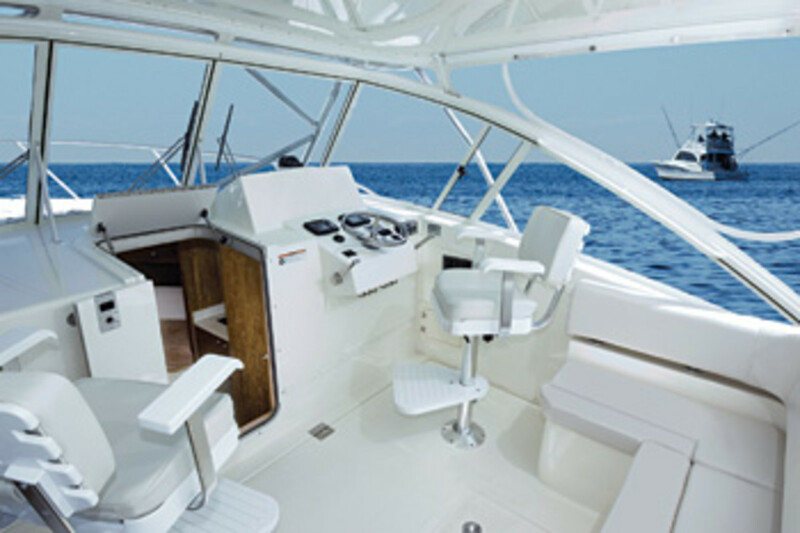 Big-game angling is priority one at Albemarle, and the standard equipment in the 108-square-foot cockpit reflects this. I counted seven tackle drawers, 12 rod holders (eight in the PipeWelders rocket-launcher and four Lee flush-mounted), and stowage below the prep station for reels and lures. 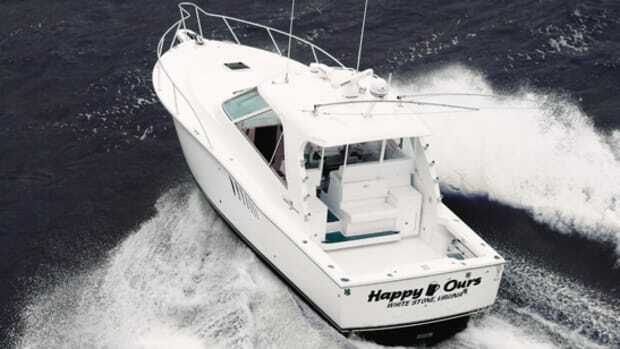 Between the 56-gallon, transom-mounted fishbox and 57-gallon, in-sole fishbox, you can accommodate a good-size catch. (The in-sole box has a removable liner for easy cleaning, but gas-assist struts are needed to keep the lid open during loading and removal.) 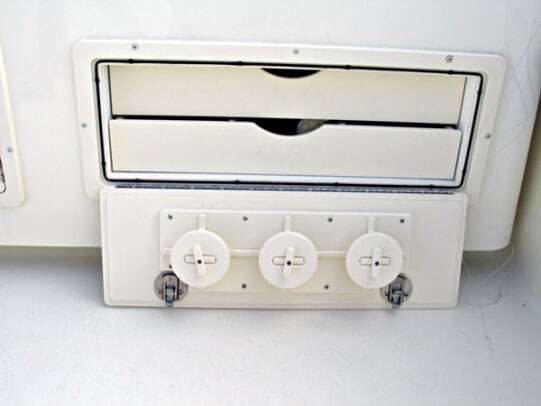 Optional padding on the 2&apos;2"-high inwales should provide comfort to stand-up anglers, but a backing plate is also laminated into the deck if you plan on installing a fighting chair. 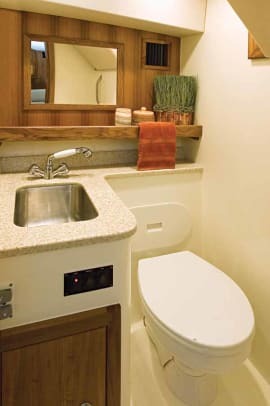 Whatever your catch, you&apos;ll appreciate the standard 1&apos;10"-wide transom door. We were having no luck fishing, nor was anyone else according to the chatter on Brandon&apos;s handheld VHF (the 330 comes without electronics). So after watching our spread for a few hours and checking on the liveliness of the goggle-eyes in the 25-gallon livewell, I retreated below decks. I noticed my boat had a forepeak V-berth and L-shape Ultraleather settee aft to port, which doesn&apos;t convert to a berth. 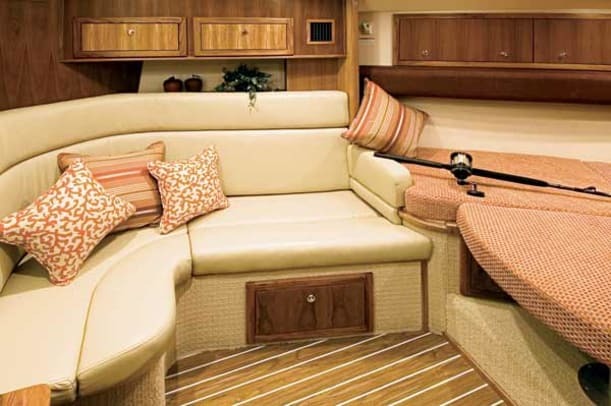 When I asked Haigler about this, he said that on future models the settee would convert into a double berth and that there would also be a pilot berth above it (note the cherry table in the deck plan as well). Since headroom is 6&apos;3", I reckoned the angler on top would have to be careful not to bump his head. But I suspect that in reality no one is going to spend too much time there. We couldn&apos;t buy a strike, and with my flight back to New York approaching, I gave Haigler a defeated nod and it was lines in. After helping straighten up in the cockpit, I stood next to the captain as the 330 hit her average top speed of 32.7 mph at 2890 rpm, 110 rpm less than the Cummins&apos; rated power. 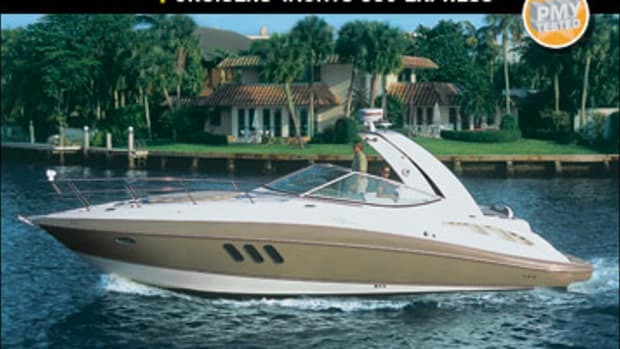 I took the wheel and found sightlines excellent in all directions, although bow rise was high (61/2 degrees) in the midrange, which I controlled with the standard Bennett trim tabs. The ride was solid, thanks to the 330&apos;s beefy construction. As with all Albemarles, her hull is solid fiberglass below the waterline, reinforced by fiberglass encapsulated, marine-grade fir stringers. 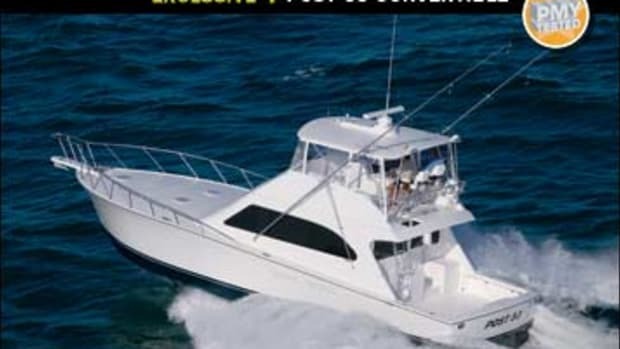 With a sharp entry, 24 degrees of deadrise amidships and 12 degrees at the transom, and Carolina-style flare, the hull&apos;s designed to bust through head seas, land softly in the troughs, and keep her windshield dry. Despite being skunked, I found a lot to like during my time aboard the 330. She has excellent fishability—Albemarle clearly understands what anglers want and knows how to deliver it in an appealing, no-nonsense package. 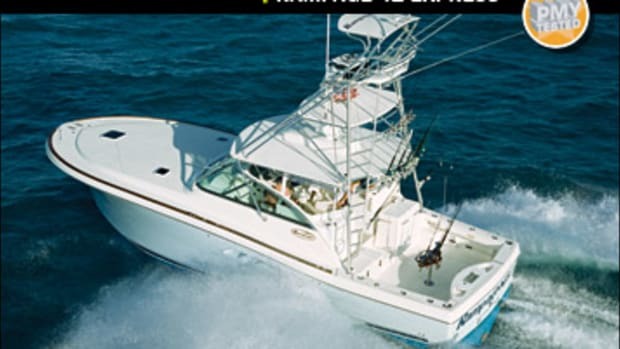 Combine that with a tough build, a good standard equipment list, and plenty of options, and you&apos;ve got a boat with a knockout punch. 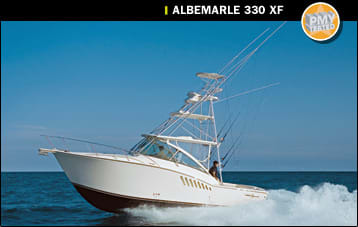 For more information on Albemarle Sportfishing Boats, including contact information, click here.